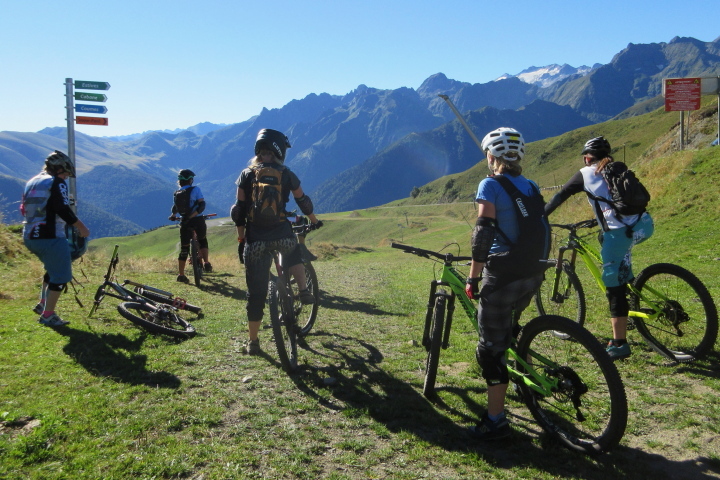 We are delighted to offer a women-only version of our highly rated XC mountain biking holiday in the stunning mountains of the French Pyrenees. 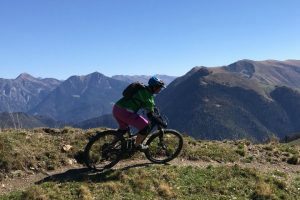 Why a women’s MTB holiday? 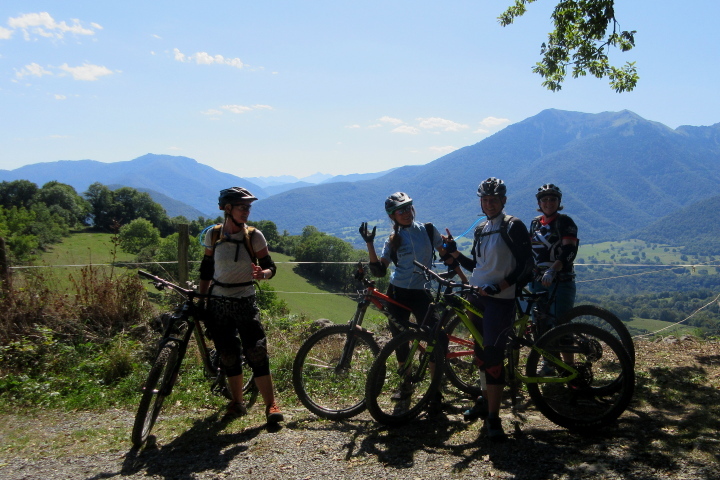 Quite simply because of the relaxed and highly supportive not to mention fun atmosphere of women only groups. 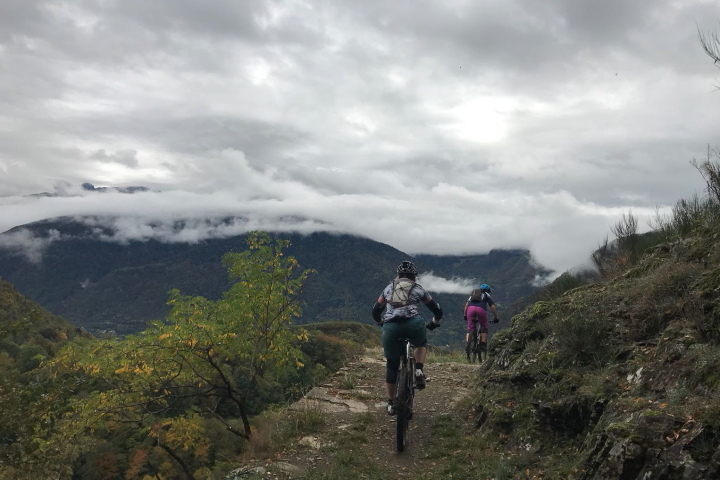 It really is an environment in which women mountain bikers thrive. To see confidence evolving over the holiday is pretty special and it’s not unusual for the group to keep in touch once they have returned home. 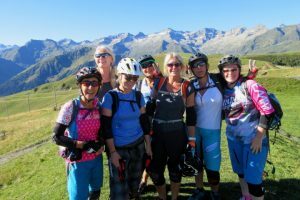 Mutual encouragement, fun and laughs tend to be the order of the day on these women’s MTB holidays plus of course winding up your male guide! He loves every minute of it, believe me! 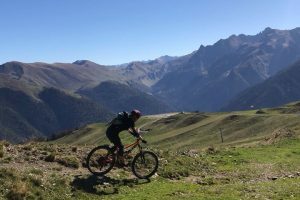 What’s the mountain biking like in the Pyrenees? 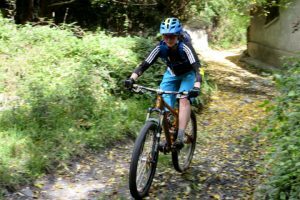 The riding will appeal to any regular mountain biker who loves riding natural trails. 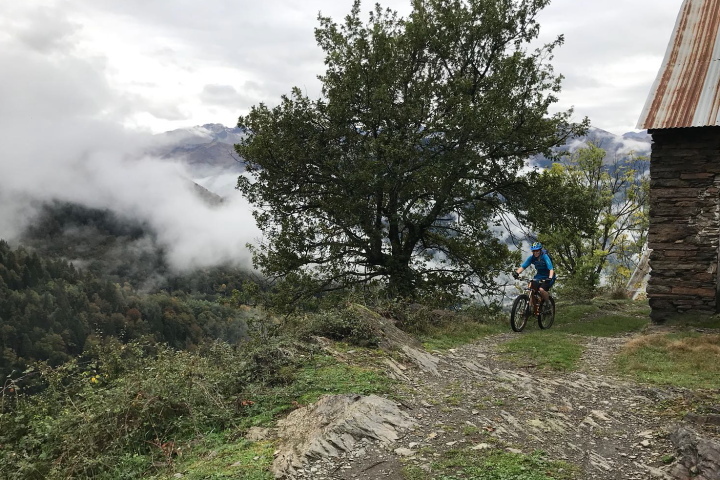 The mountain biking in the Luchon area of the French Pyrenees is varied and challenging, the scenery breath-takingly beautiful and the trails quiet and off the beaten track. 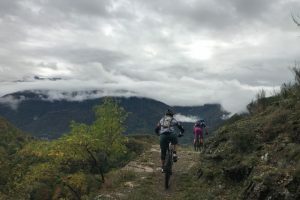 There is an endless variety of trails here, some fast and flowy, others rocky and technical, with long fireroad ascents that will challenge your endurance to off-camber singletrack that will test your balance and your nerve. Those mountain bikers who have the confidence and ability will be able to challenge their skills on the steeper more technical terrain whilst those seeking an easier ride will have route options to suit them. Is this women’s MTB holiday for me? 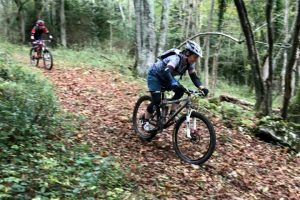 If you are a regular XC mountain biker who has a reasonable level of fitness and a good ‘can do’ attitude then this is the perfect opportunity to improve your form, skills and confidence. You will be out on the trails typically from 10am to 4pm on the 5 days that you will be riding. 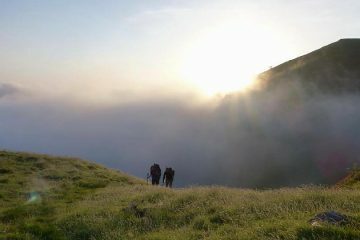 But the pace will be up to you. You are on holiday after all! Skills coaching is provided as a matter of routine by your professionally qualified guide. 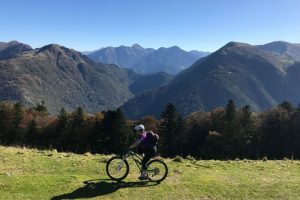 Whether it’s your bike set up, body position or riding technique that is letting you down, you are sure to return home equipped with some hot tips that will help you take your riding to the next level. 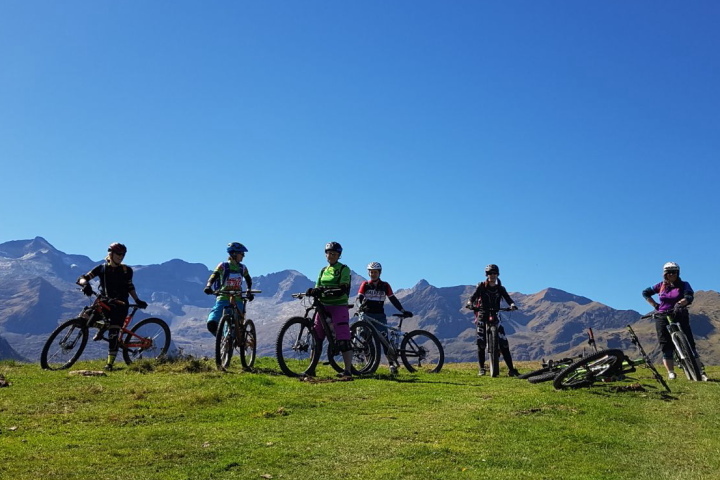 Your base for this women’s mountain biking holiday is a relaxed, no frills small hotel with a ‘kick off your shoes and make yourself at home’ philosophy. 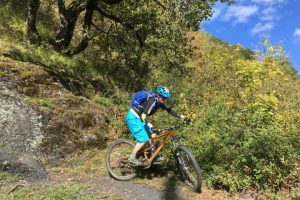 The accommodation is in a quiet location and yet within walking distance of Luchon town centre and also the outdoor swimming pool and Vaporarium. 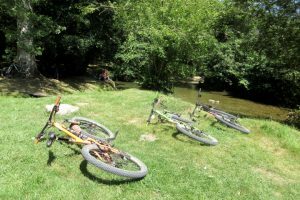 You’ve got secure bike storage facilities here as well as bike washing and bike maintenance facilities. 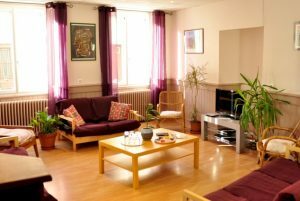 The rooms are basic but practical, some with en suite facilities, others sharing two shower rooms and WCs on the landing. Russell is renowned for his cooking and his evening meals are legendary. 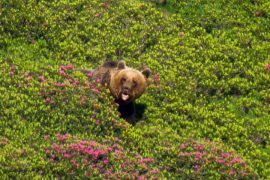 He uses locally sourced produce as much as possible and the three course meals will satisfy even the biggest of appetites. The breakfast buffet includes cheeses, ham, yoghurt, a variety of cereals, breads, pastries, tea, coffee, hot chocolate …. you get the picture! Super mtb trip to the Pyrenees. 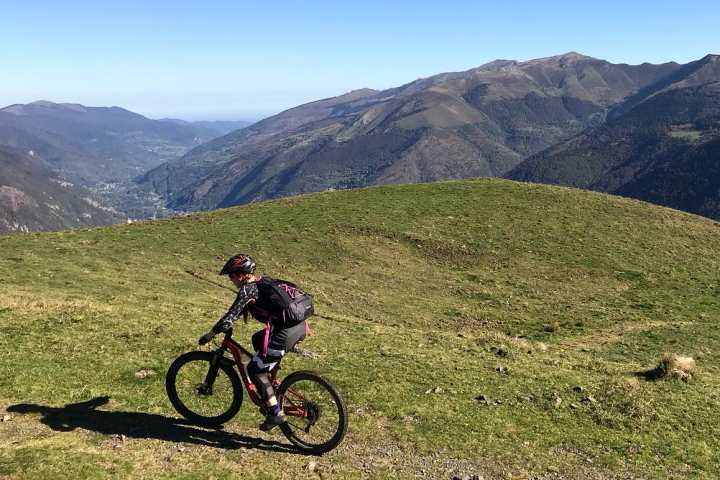 Great town (Luchon), wonderful varied days out with our guide Ian, bit of mtb coaching thrown in to help tackle a few narly, steep sections and get us out of our comfort zone (in a good way)! Our food at Le Lutin each evening was superb, Russ is a fantastic chef! 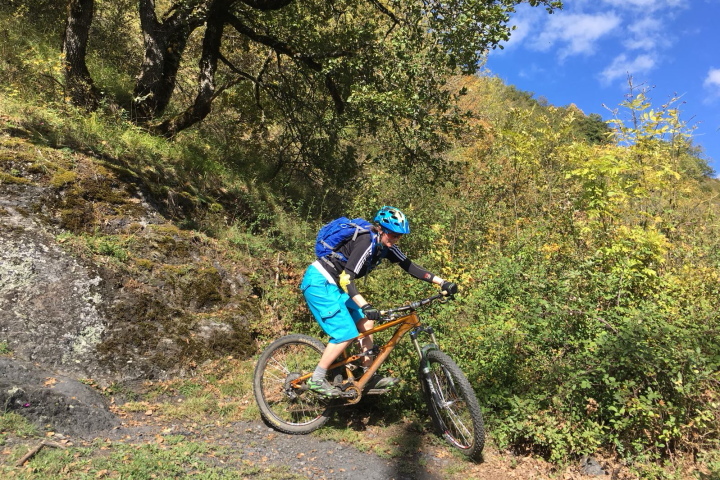 Weather was beautiful, scenery spectacular and transfers to Luchon timely and easy. 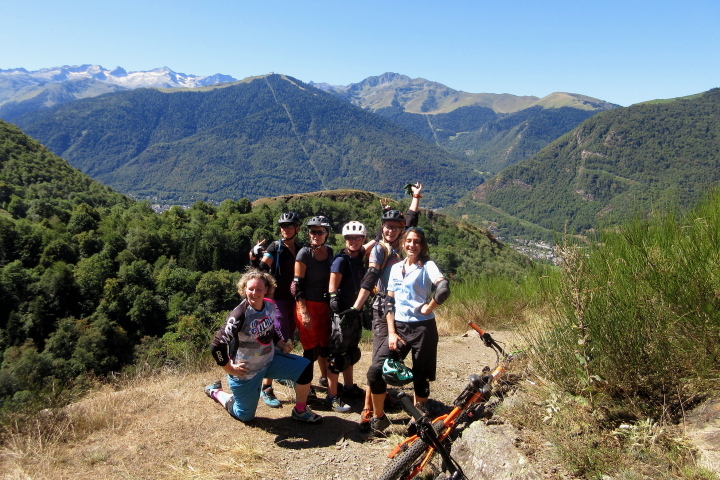 A super week mountain biking in Luchon with Adventure Creators! Lovely trails, even lovier food and a great group of ladies to enjoy it with! 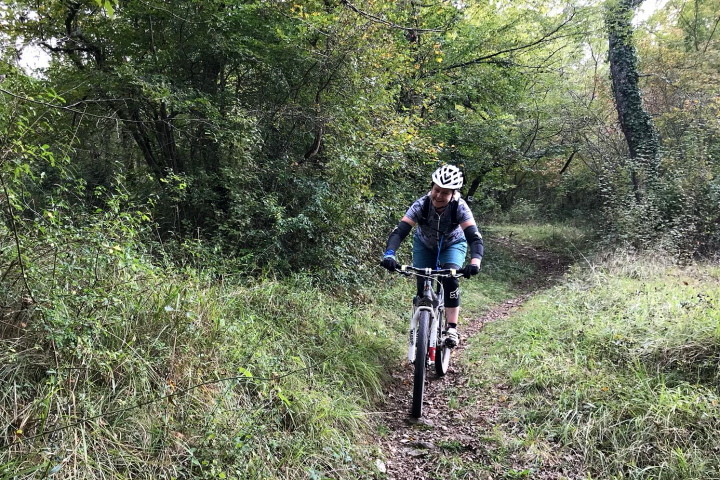 Ian (the guide) showed us some cracking descents and climbs! 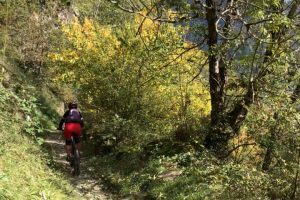 The rainy first day made us appreciate the lovely autumn sunshine for the rest of the week! 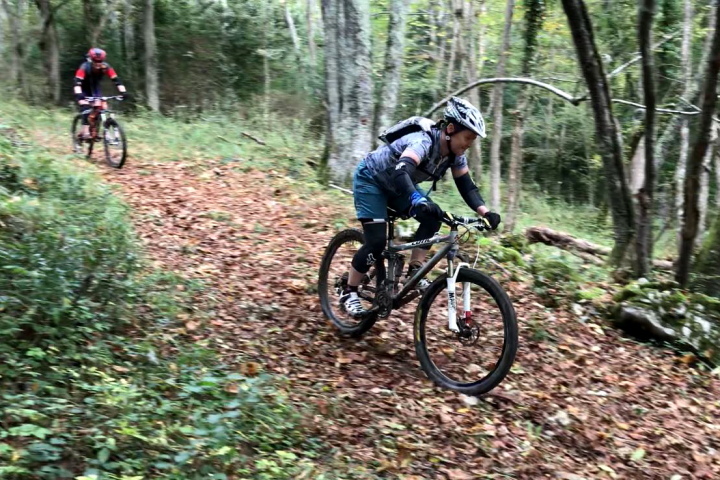 Well I didn’t know quite what to expect, I thought I’d be way in over my head, however with the super experienced guiding provided by Ian, both myself & others felt much more capable & confident at tackling stuff! 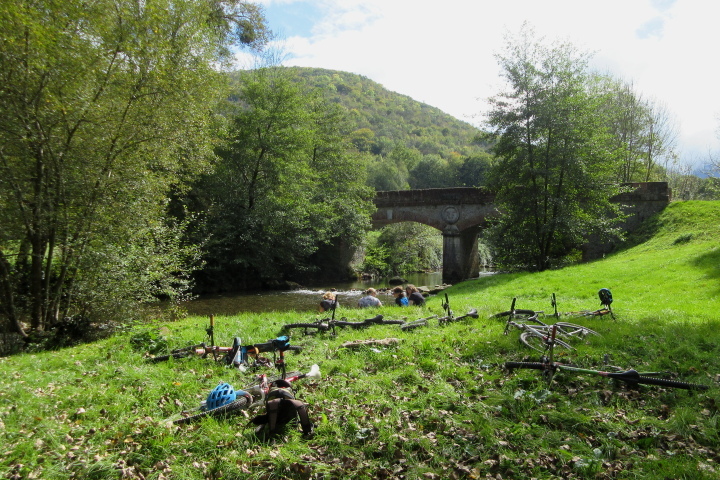 The local area is truly beautiful, the trails & scenery were brilliant, with lots of local wildlife. Le Lutin is well located to town, the hosts were lovely & couldn’t do enough to help, & the food! Wow we were spoilt at every meal. 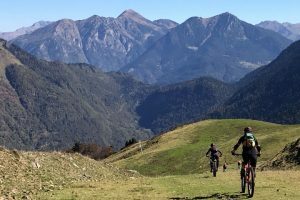 Luchon is a great place for a cold beer after a hard day on the trails & also good for wandering round the twice weekly market. 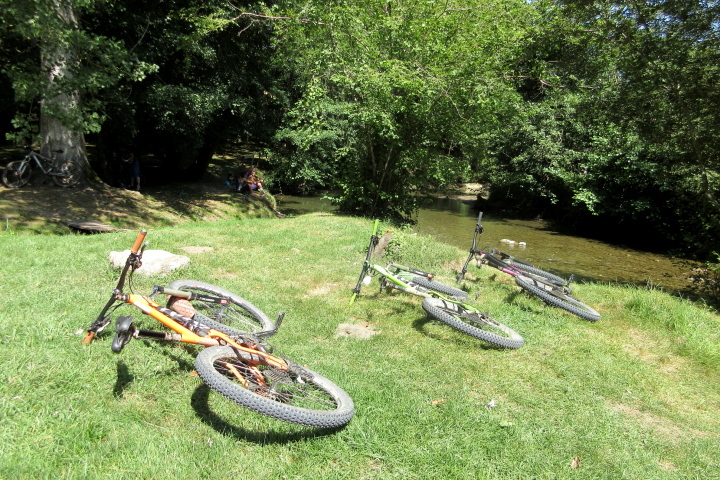 I decided to hire a bike rather than take my own, & by the end of the week I wanted to take it home with me! Met a great bunch of people, & had a fantastic time! 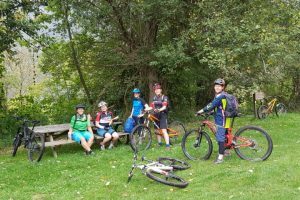 Thanks to all who organised it all! 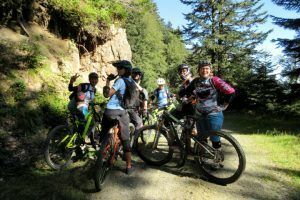 The ladies mtb xc week was really super. 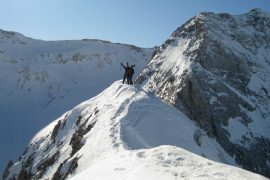 The guiding was excellent and I learned a lot from Ian about both climbing and descending, and gained in confidence too! The scenery was second to none. The food at the hotel was superb and catered for all tastes/diets and they really made us welcome. 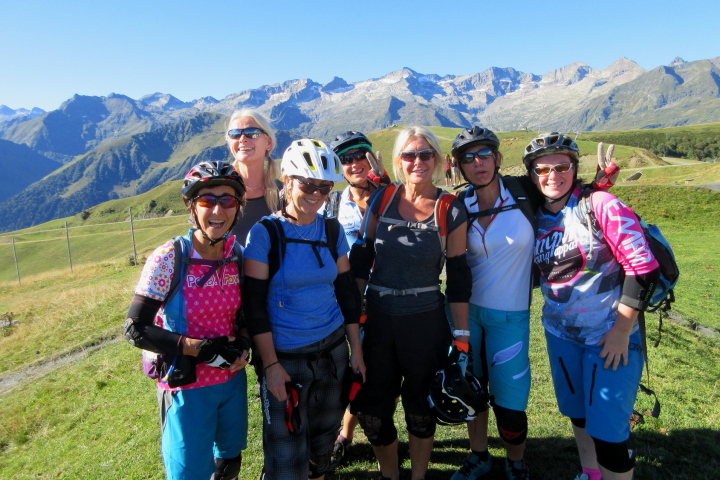 A fabulous trip, thanks to all who made it happen and the fabulous group of ladies who were there with me! Luchon is a fabulous area for mountain biking; such a wealth of superb trails, gorgeous scenery, abundance of wildlife and a lovely town to relax in at the end of the day. 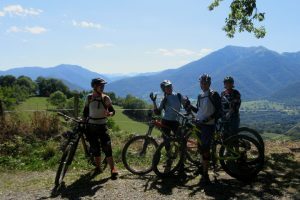 The highlights of our week were the brilliant guiding and coaching from Ian and the lush cooking by Russ at the Gite. Adventure Creators arranged everything perfectly – thanks Penny for an amazing week, I’ll be back! I genuinely had one of the best weeks of my life on this holiday. 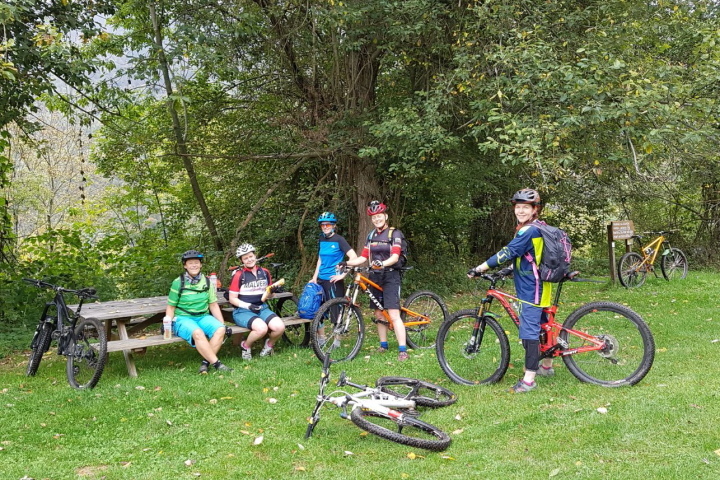 Before coming I was so nervous about my abilities in the group (I’d only really ridden with my boyfriend so had no idea how I’d get on in a different group of riders) and quite anxious about going on my own. I needn’t have worried. 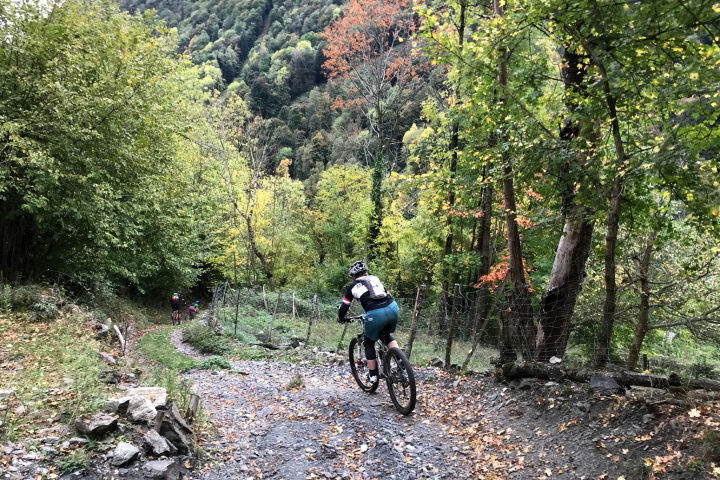 The women were amazing (of course), the people I met were so friendly and inclusive, Luchon is just picture perfect with plenty to do in ‘down time’… Only wish I could go back and do it all again! 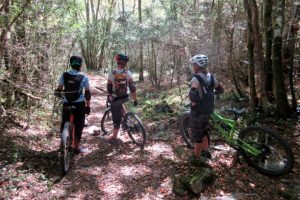 Or just find a way to get paid to ride and chat about it. The accommodation was simple but perfect. 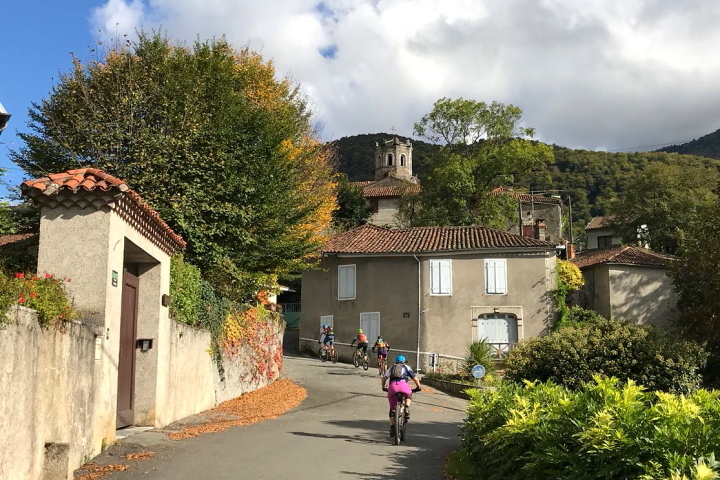 Close enough to town to be easy to walk to for post-ride coffees/the bank/the shops, Benny and Russ were the best hosts and went above and beyond to be helpful. Honestly don’t think I’ve ever been fed quite so well in my whole life. Every meal was delicious, made from scratch and full of healthy ingredients (perhaps less so for the desserts but they were too good to pass on each evening!). Accommodation was roomy and clean. No complaints. 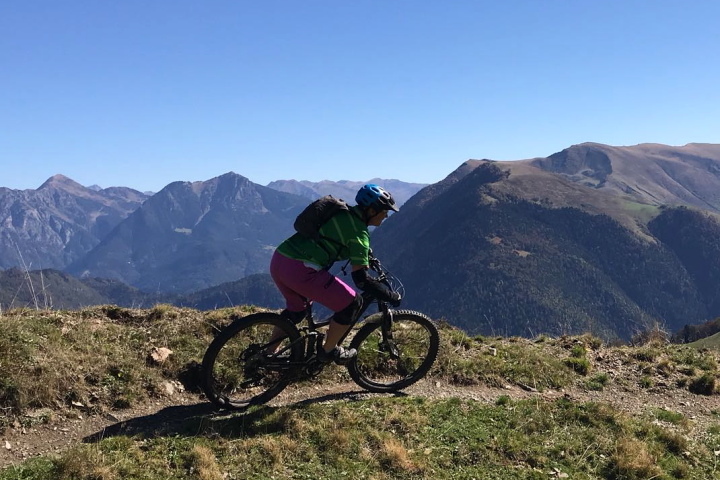 My confidence has soared due to this week biking in the mountains. 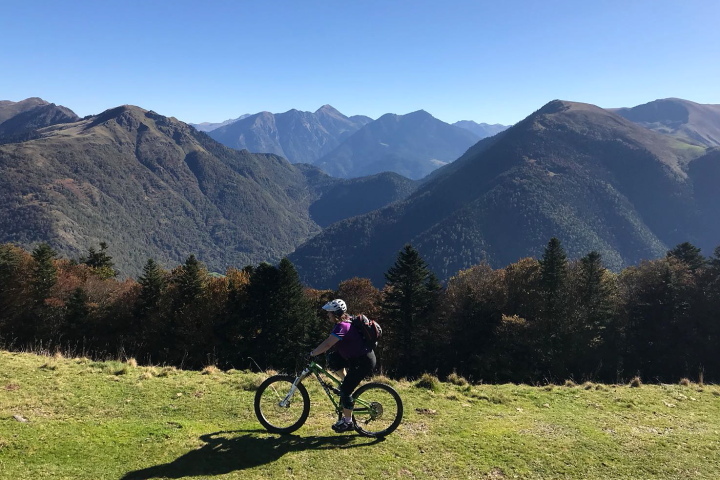 From undulating days to getting the bubble up and riding back down, I felt pushed with the steepness on some routes and with the technical bits on others, but in a really great way. 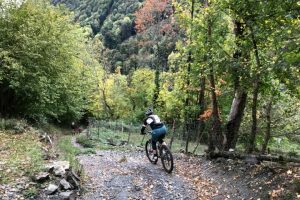 Everyone was very supportive and I knew that if I really didn’t want to do something, that was my choice. And because the pressure was taken off, I ended up doing way more than I ever expected I could. 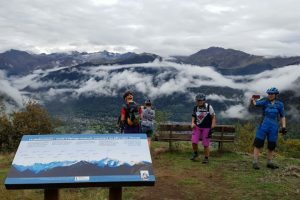 The views were breathtaking, the picnic sites were beyond perfect, Ian the guide managed very well with such a raucous group of women (deserved a medal). 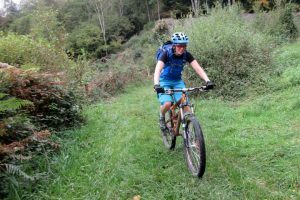 Everyone else took their bike out with them but because I’ve never ridden a full suss, I rented a cotic rocket… Big mistake because now I am trawling the net for a full suss of my own! 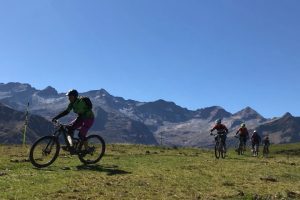 I cannot find the words to recommend this holiday enough. I am beaming about this holiday… Absolutely fantastic from beginning to end. 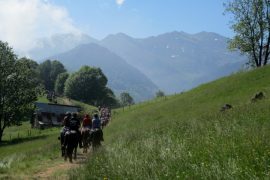 Transfers to the hotel, beautiful food cooked by the Gite owners, catered for and looked after from start to end. 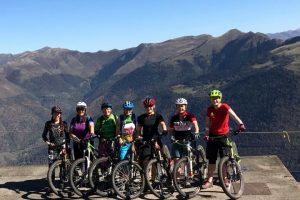 We were a mixed ability group of female mountain bikers & yet each day we had routes planned which catered for everyone’s specific wants & needs, the professional guides there to have a laugh as well as share knowledge and teach some skills. Stunning scenery, great climbs for the fitties, super descents for the adrenaline junkies, & even time by the outdoor pool overlooking the mountains. Even better, a visit to the thermal baths and spa to relax our tired muscles. Absolutely loved this holiday, not only for the experiences but the laid back lovely people I met… Penny it was a pleasure to ride with you & thank you for putting together a fantastic holiday for us. Definitely see you again.